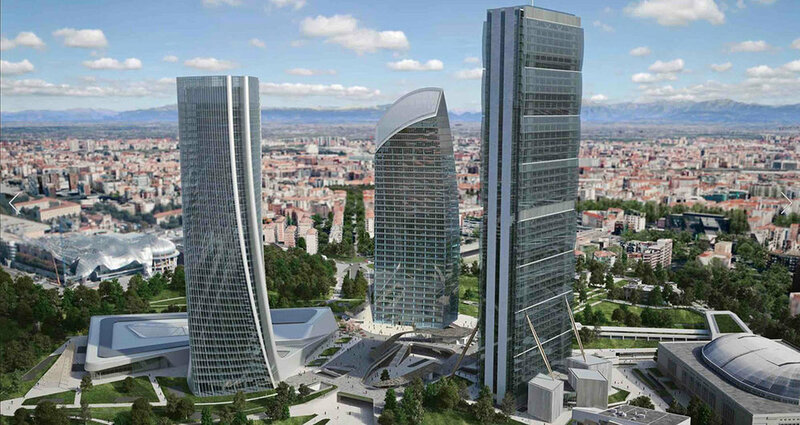 The tower is located at the center of the new master plan for the neighborhood of Fiera Milano. Situated between Hadid and Isozaki’s towers, the Libeskind tower slopes in toward its counterparts and the central park below. The curved tower’s facade is made of sustainable state of the art glass, which will reflect the public space below and the vistas around. The Libeskind tower, as well as its neighboring buildings, is designed to produce a sculptural and highly visible skyline on the site. The designs of the skyscrapers go beyond the superficial treatment of facades and create a spatial and functional disposition of spaces with extraordinary internal vistas and activities for their users. At the base of each tower are retail spaces and public amenities which help dissolve the boundary between the public and private commercial realm. The towers have been carefully positioned in order to provide appropriate shade, maximum light and a pleasant atmosphere at pedestrian level. This allows for the new piazza to be a huge amenity for both the residents of the new housing and the workers in the office complexes.